SNOW! Yes, in SEATTLE! It happens once a year, sometimes just for one day or night. 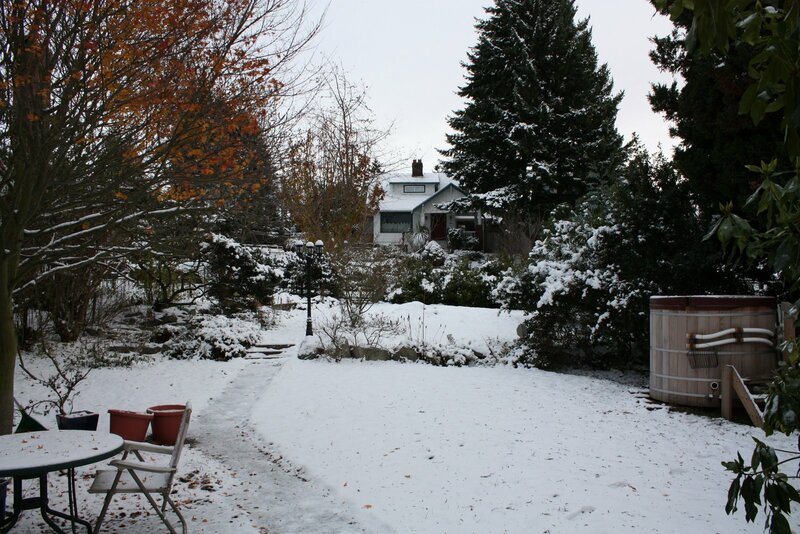 Saturday temperatures dropped to below freezing and snow fell in lovely fat flakes through the night. For an easterner like me, it was heavenly nostalgia. Sunday morning we tromped out to the hot tub to wonder at the snow from the heat of our cedar tub and see what the chickens would think of it all. They decided they didn’t like it. As the wind picked up and the snow piled thickly on bare branches began falling in clumps, one shrieky chicken flan out to the run and then disappeared back into the coop, not to return. We’d built the run attached to the coop so the chickens could be outside in inclement weather, should they choose, but wind had blown snow across the floor of the run during the night and the chickens were having none of it. Snow stops this city; we don’t have the arsenal of ploughs and sanders that you find in snowy cities, plus we have a lot of hills – some of them quite ridiculous. Mid-day Sunday we walked the 1.5 icy miles to ‘The Junction’ where we had an errand to run, laughing at the silly drivers trying to get around in their cars. Monday I had to cancel my appointments on campus and worked from home, checking in on the chickens so they wouldn’t get too bored. I was also worried they might die of dehydration or exposure; it’s been cold. Highs have been just below freezing and plunge into the 20s F (-7C) at night. The coop is uninsulated with open venting all around the roof and their water kept freezing. 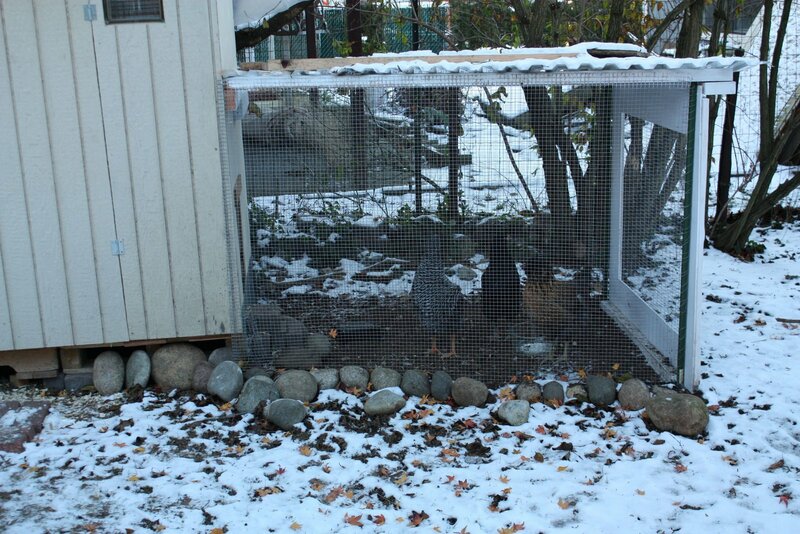 Besides the risk of boredom, the chickens appeared fine. They stayed in the coop all day Sunday and all day Monday. This morning they were interested in venturing outdoors. 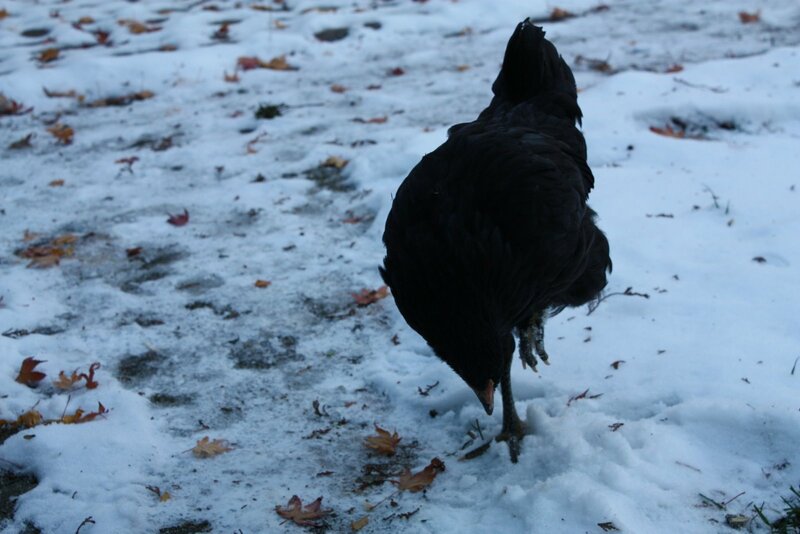 Before I knew it they were wandering on the frozen foot paths pecking at…stuff. Mostly they are hanging out on – you guessed it – the front stoop (poop) and drinking the snow from the planter boxes. Funny chickens. This entry was posted in chickens, winter. Bookmark the permalink.